In Dracula, Van Helsing gives a wreath of flowers to Lucy, whom he suspects is the victim of a vampire. 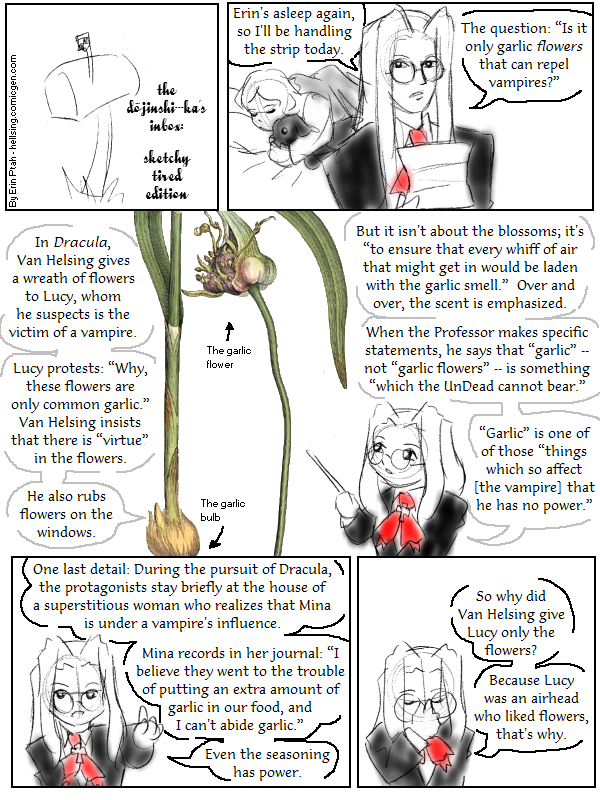 Lucy protests: “Why, these flowers are only common garlic.” Van Helsing insists that there is “virtue” in the flowers. He also rubs flowers on the windows. But it isn’t about the blossoms; it’s “to ensure that every whiff of air that might get in would be laden with the garlic smell.” Over and over, the scent is emphasized. One last detail: During the pursuit of Dracula, the protagonists stay briefly at the house of a superstitious woman who realizes that Mina is under a vampire’s influence. Mina records in her journal: “I believe they went to the trouble of putting an extra amount of garlic in our food, and I can’t abide garlic.” Even the seasoning has power. So why did Van Helsing only give Lucy the flowers? Because Lucy was an airhead who liked flowers, that’s why.